Truer words could not have been spoken, especially when playing a game where the goal is to end up holding a card with a ranking closest to, if not actually holding, the Princess. Love Letter by AEG, has a big heart inside if its tiny shell. When AEG picked up this game for distribution in the United States (it was originally published in Japan), it spread its love from coast to coast and is been credited with kicking off the modern micro-game craze. There are 16 cards, 4 reference cards, and 13 (strange choice of number) red cubes, all cinched up in a swank, velvety red drawstring pouch . Set in the fantasy world of Tempest, you take on the role of a suitor, trying to get your letter of affection to the Princess. In order to get ahead of the other suitors (the Princess is quite popular), you have to “influence” members of the court, including guards, priests, handmaidens…even the King! This is accomplished by having either the highest card number remaining after all the cards are drawn, or being that last suitor standing (all other players are eliminated). Game play is quite simple, yet filled with deduction and strategy. Each player has one card to begin with. On your turn, you draw a card and play a card. Simple enough. Those cards have actions which allow you to do things like compare your card with another play (lower number is eliminated), trade cards, select someone to discard their card and then draw a new one, etc. The catch is, prior to the start of the round, a certain number of cards (determined by the player count) are removed from play. That way, you don’t always know what is, and isn’t, in play. The Approach: It’s a Valentine’s special, what do you think the songs are about? Love. The way you feel when you see the one you love. How much you wish they were with you or understood how much you truly felt for them. 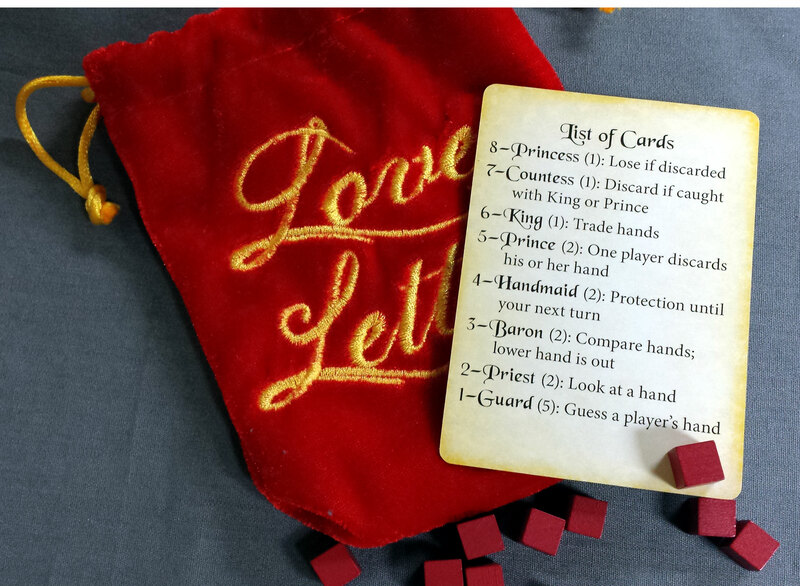 What better way to spend a day celebrating romance with the one you love, than sharing part of your evening with some sweet songs of love and a few games of Love Letter? In actuality, I can think of at least one better way – but hey – this is a good opener, right? Also, never mind that the game plays better with three or four people. Better yet, throw out the suggestion to include others and see how it flies…it might be the best Valentines ever. 1. Tom Petty – Here Comes My Girl: Times are tough in Tempest these days, but every time you see the Princess and think about you and her together, it makes everything all right. Tom Petty is rock and roll and this is a perfect example of his ability craft a song. Each verse is somber in tone, but every time he sees his girl and thinks about her love, it comes together and changes to a more hopeful tone. He shouts out how perfect her love is and the piano trickles in like rain after the chorus starts, sending it into a perfect love song. Well played, sir. 2. 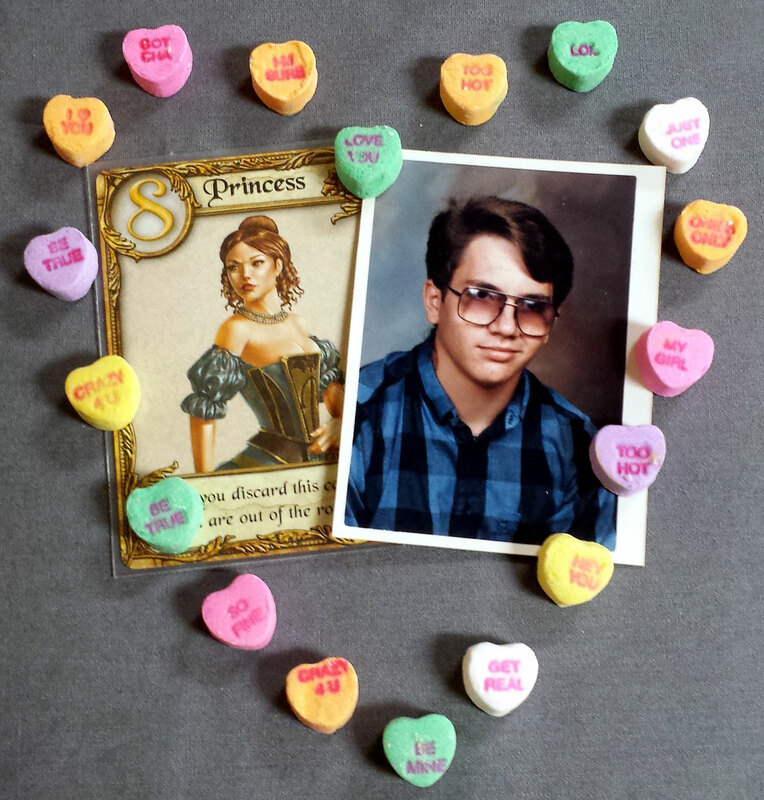 Steve Earle – Valentine’s Day: Sometimes love isn’t pretty or well rehearsed. It can show itself most when everything around seems torn and frayed and all you have left is the truth. Out of those ashes can grow true love. This song is a true story. 4. Dusty Springfield – So Much Love: We have focused so much on the Prince, but what about the Princess? Maybe she is as smitten for you as you are for her? Dusty’s, Son of a Preacher Man is what most people know her for, but her catalog is full of beautiful songs; this one being at the top of the list. She sings, “Now to you it might seem a little thing, but to me it seemed you’d changed my Winter to Spring.” Sold. 5. Van Morrison – Into The Mystic: There is nothing really to say about this song. Just listen. 6. Alice Cooper – You and Me: Yes, Alice Cooper. The original shock rocker can pen a tune and has put out some pretty romantic songs, in between loving the dead and cutting off his own head (or hanging/electrocuting/impaling himself). You need to convince the Princess that the both of you are just regular folks in love, and that’s good enough for you. For the video, I included the clip of this song from The Muppet Show. Alice Cooper and the Muppets. It rarely gets cooler than that. 7. Freddy Fender – Before The Next Teardrop Falls: This is a serious selection and if you really listen to the song, you will soon agree. The most noble thing you can do when the Princess is courting one of the other suitors, is let her know that you will be around when her heart breaks. 8. Journey – Stay Awhile: Without an ounce of insincerity or parody, I love Journey. They were a really solid rock and roll outfit and Steve Perry could belt them out like no one before him, or after. How could the Princess not choose you after hearing this plea for just a few moments together? 9. Peter Gabriel – In Your Eyes: Now is your chance. Hold that minstrel over your head and have him play this on his lute. It works every time. Love letter theming aside, I can still picture my wife at our wedding, walking in to this song. Lloyd Dobler had nothing on me. 10. Rhett Miller – Question: It’s your letter the Princess received. You had her at “Dear Princess,” and now is the big moment that could change both of your lives forever. I am unabashedly in love with this song. Rhett Miller, front man for the Old 97’s (of which I consider one of the best bands in America), is a brilliant songwriter who weaves in equal amounts of clever wordplay and human truth to create fantastic songs that stick in your head. I think of my wife when I hear this song, and remind myself how thankful I am she said yes to the question.